Graham's booklet says: "Featuring a coin embedded in the earth, this card represents the highest form of skill and talent. Earth is an element that symbolizes opportunity. We feel a sense of stability as we begin to benefit financially and materially from our work. Divinitory meaning: The Ace of Coins represents a solid foundation. Reverse Meaning: Possessiveness, hoarding of wealth, fear of letting go." I can't think of the word for using pictures to represent words (you know, like having a picture of two halves of a bone to represent Bonaparte), but it struck me that this card shows Earth Coin Village. I didn't know what to think about the brick- if that's what it is- embedded in the grass, but when I read Graham's mention of a sense of stabiltiy it reminded me of the weights that they put on tires in order to stabalize them. Why is it floating? Is there "money in the air" waiting to be seized? It's shadow is directly underneath, so the Sun is overhead shining down it's abundance. This coin seems an earthly mirror of it, shining down on this humble abode and giving the inhabitants something tangible to reach for. 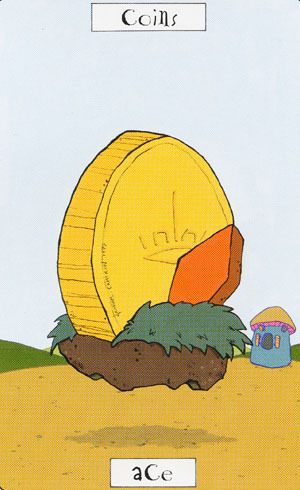 The large, golden coin on the Ace of Coins is energetically hovering in the air, but still manages to stay grounded: the coin is implanted in a big chunk of earth! (Also embedded in the earth is the diamond-symbol from playing cards-suits.) I think this shows one of the most important aspects of the suit of Coins: being grounded, sensible and down-to-earth. The suit of coins is linked to the element of earth, and thus it is appropriate that, of all Aces, this card has the most greenery. I went for a cycling-tour in the beautiful countryside in Ename the day I drew this card, and I enjoyed every bit of it (even though there were some very steep hills). I felt connected with nature and at the same time it was a good workout. Graham writes that this card “represents the highest form of skill and talent”, so I think it’s very apt that his signature is clearly readable on the large coin (I haven’t seen his signature in any of the other cards so far). I feel that the Ace of Coins shows what Graham has worked to during the creation of this deck, and I think it’s a good example of what determination and hard work can lead to. The symbol engraved on the coin could very well be a crown, and could show the summit of artistry and craftsmanship. ... giving the inhabitants something tangible to reach for. That’s a very good observation, Galadrial. Because the coin isn’t floating high, it stays in reach and seems very real. This coin is very big. Big enough for everybody to see it (or touch it) I wonder if this floating coin is stationary or if it is slowly moving around. For now, it's seems to be over an agricultural field (or a garden) The field is all cleaned up from what was growing there. Maybe the house we see is a store room.